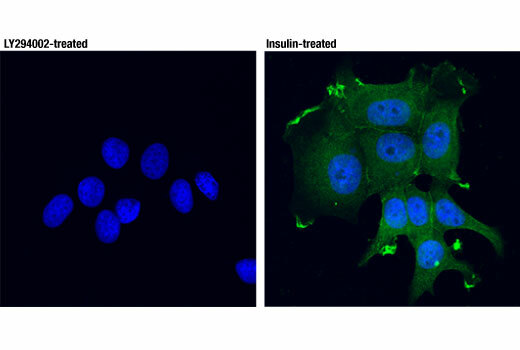 Confocal immunofluorescent analysis of MCF7 cells, either treated with LY294002 #9901 (50 μM, 2hrs; left) or treated with insulin (100 nM, 15 min; right), using Phospho-Akt (Thr308) (D25E7) XP® Rabbit mAb (Alexa Fluor® 488 Conjugate) (green). Blue pseudocolor = DRAQ5® #4084 (fluorescent DNA dye). Flow cytometric analysis of serum-starved NIH/3T3 cells, untreated (blue) or treated with mouse platelet-derived growth factor BB (200 ng/ml, 15 min; green), using Phospho-Akt (Thr308) (D25E6) XP® Rabbit mAb (Alexa Fluor® 488 Conjugate). 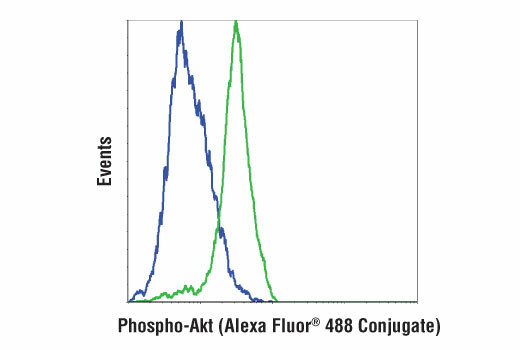 Phospho-Akt (Thr308) (D25E6) XP® Rabbit mAb (Alexa Fluor® 488 Conjugate) recognizes endogenous levels of Akt1 protein only when phosphorylated at Thr308. This antibody also recognizes endogenous levels of Akt2 protein when phosphorylated at Thr309 or Akt3 protein when phosphorylated at Thr305. This Cell Signaling Technology antibody is conjugated to Alexa Fluor® 488 fluorescent dye and tested in-house for direct flow cytometric (mouse cells) and immunofluorescence (human cells) analysis. This antibody is expected to exhibit the same species cross-reactivity as the unconjugated Phospho-Akt (Thr308) (D25E6) XP® Rabbit mAb #13038.